The disaster in Flint, Michigan brought much-needed attention to the aging and failing infrastructure of the United States, illustrating the incredibly important and often unseen role plumbing plays in our lives. Public health and plumbing go hand in hand – a fact that’s easily forgotten in the industrialized world, where the majority of people have ready access to clean water and waste removal. Outside of tragic failures like Flint, we rarely find reason to consider where our water is coming from, how we get it, or how we deal with our waste. The developing world, as we all know, is not so lucky; the link between plumbing and health is vividly embodied every day. Open defecation is still a thing in a disturbingly large part of the world, and simply providing toilets doesn’t seem to be enough. In some parts of the world, women and girls still walk miles everyday to retrieve water of dubious quality, while schoolgirls too often “hold it” for fear of shame or sexual assault, made all too easy by a lack of adequate facilities. While there’s clearly a need for improvement and reform, solutions are hard to come by, and even harder to implement. It’s no exaggeration: we could not be the wealthy and powerful country we are without the foundation that the art and science of plumbing provides. It’s not a bad place to be: when’s the last time you worried about how you were going “to go” (beyond a dirty seat in a public restroom)? When did you not have access to (relatively) clean water? When these kinds of things aren’t a concern, the sky is the limit. 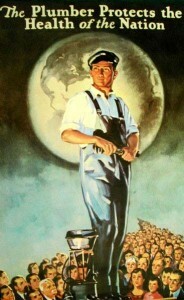 And that, we think, is what World Plumbing Day is all about. Obtaining clean water and disposing of bodily waste is a foundation upon which every other aspect of a successful society relies upon. World Plumbing Day asks us to reflect on the innumerable benefits this trade bestows upon community and culture, and to find ways to increase its prevalence in those places still struggling. Despite all the jokes and negative perceptions so common in the industrialized world, the fact remains: plumbing truly does protect the health of a nation, and will always be the first line of defense against sickness and disease. Effective plumbing systems are a bridge to greater things, and we join the World Plumbing Council and WHO in this day of recognition and appreciation for all the things plumbers and their designs do for our world. Next: Spring Cleaning? Don’t Forget Your Plumbing! The only thing I hated about this industry when I was doing it back in my country (3rd world country) is the pay day, the plumber in these countries is one of the lowest paid profession, I was struggling all the time with my financial situation, I used to work 50-80 hours a week to have a good pay at the end of the month, but thank god, after my family and I immigrated to Australia 15 years ago, everything has changed, the income for good plumber is great in this country, and I can say now that I’m financially secured because of this great profession that I will always like and perform. I have my own company now called Wilco Plumbing, we do all kind of plumbing services all around Sydney. I just wanted to share my story in here, maybe it motivates any young person who is trying hard to reach somewhere in life. My Granddad made me decide that I wanted to be a plumber. He helped rebuild the UK after WW2 and the reason he continued to be a plumber until he was 87 (yes, 87!!!) was because he felt it was the most important service he could give to the community. His passion led me to working for him as a rookie and eventually setting up my own business (Durham City Plumbers). I have loved developing my plumbing skills and hope to pass my passion down to my grandson who turns 6 on Saturday. I am a plumber in Australia, and plumbing here is seen as an important trade, and and a must to keep ourselves and our water system healthy. One of the areas we specialise in is blocked drains, if drains cannot be unblocked this results and in sewerage and the water not be ok to drink. This will in turn leading to many people becoming sick from drinking contaminated water. Whatever you do, do not try and unblock the drain yourself, you need a professional to do this and will just make the problem worse!